* Are traders on the Trader Register approved by Trading Standards? No, we do not approve traders, however they have all signed our Code of Practice which commits them to honest and fair trade and providing good customer service. Before we allow a trader to be listed on the Trader Register we do certain checks on the trader, such as checking our databases for any adverse history, checking trade memberships that traders claim to be a member of and requesting up to six references from customers from the previous six months. * How do I choose a Trader from the Register? Enter your postcode and the type of trader you are searching for e.g. plumber. You can ask for the list to contain 5, 10 or all of the traders, the website will choose the traders closest to your home. You can then look through the list and decide which traders to contact. We recommend obtaining three written quotes from the traders before making your decision. * What if something goes wrong? Prior to joining we require that traders commit to working with customers and try to resolve any problems that may arise. If you cannot resolve the issue satisfactorily with the trader, Trading Standards have a Complaint Resolution Procedure, Trading Standards will assist both traders and consumers in accordance with the complaints procedure. * How can I avoid problems? We have produced a standard contract which you can use to record all the details of the work to be done. In our experience if everything is put in writing there is far less chance of things going wrong. Do not rely on either verbal quotes or verbal agreements as these can cause misunderstandings and ambiguity even with a good trader. * Does the Register cover all trades? The Trader Register was intially set up to enable consumers to find traders within the home improvement sector. We are now happy to consider applicants from any sector providing they can meet our criteria. * How do I know if the feedback is genuine? Trading Standards will audit the feedback and make checks to ensure the feedback has come from genuine customers. Feedback will only be accepted from a consumer supplying their name and address. * What happens if a trader claims membership but is not on the website list? Please contact Trading Standards immediately. Please report via tradingstandards@sthelens.gov.uk or 01744 676299. * Can a Trader be removed from the Trader Register? Yes, any business that does not comply with the code of practice or acts against the best interests of the consumer can be suspended pending investigation or removed from the register completely. * How much does it cost? This service is provided free of charge for consumers. * How can I give feedback on a Trader? Members of the Register should actively encourage their customers to give feedback on their experience of the business. Feedback can be given online via the Trader Register or via a customer feedback form supplied by the registered trader. To register your business on the Trader Register there is an annual membership fee of £94.82, any new traders will also be required to pay an initial, one off administration fee of £37.64. * Why should I become a member? Traders who are accepted to the register can benefit from independent recognition of their business standards which may create a unique selling point and help generate increased trade. 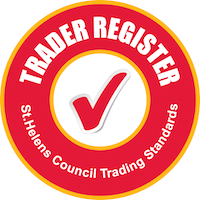 Trading Standards and the St Helens Chamber of Commerce will actively work to publicise the Register within St Helens. Traders will also have access to advice and assistance from Trading Standards as well as updates on legislation or relevant business information. Prior to joining we require that traders commit to working with customers and try to resolve any problems that may arise, we ask that you do try this, if you cannot resolve the issue satisfactorily with the consumer, Trading Standards have a Complaint Resolution Procedure, Trading Standards will assist both traders and consumers in accordance with the complaints procedure. In our experience if everything is put in writing there is far less chance of things going wrong. Do not give either verbal quotes or verbal agreements as these can cause misunderstandings and ambiguity even if you have the best of intentions. * How will I receive feedback? Members of the register must actively encourage their customers to give feedback on their experience of the business. Feedback can be given online via the Trader Register or via a customer feedback form supplied by the registered trader. Members must make consumers aware that feedback can be given, our star rating mechanism means that it is in the traders best interest to ask customers to provide feedback. We recommend were possible customers leave the feedback via the website, however if this is not possible please leave a feedback card with the customer.